The Label Software lets you design Address labels, CD/DVD labels, Folder labels, Media Labels, Post cards, Shipping labels, and even Envelopes. This application comes with a lot of pre-designed label templates, pictures, shapes, symbols. You can choose them from a vast library and then custom with your own logo, images and clip art to create your own labels. Powerful vector graphics editor program with which you can get your labels with very high quality when your designs are translated to printing. Supports to print your design on any standard papers at your local printer. Also it's allowed to save your publication as a high quality image with PDF, BMP, JPEG, GIF, PNG, TIFF format for outside quality printing. For easy you make a wise decision to purchase our product SmartsysSoft Label Maker, we offer you its demo version here. After installation, you can test all features of this program and then dicide whether to buy this product or not. If you are a licensed user, you can download the trial version and install it over the previous installation to update. SmartsysSoft Business Publisher was published with major update on . 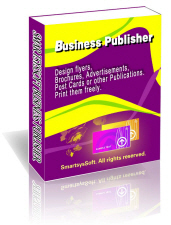 SmartsysSoft Business Card Maker was published with major update on . SmartsysSoft Greeting Card Designer was published with major update on . 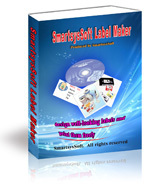 SmartsysSoft Label Maker was published with major update on . Copyright © 2007 - 2015 SmartsysSoft. All rights reserved.